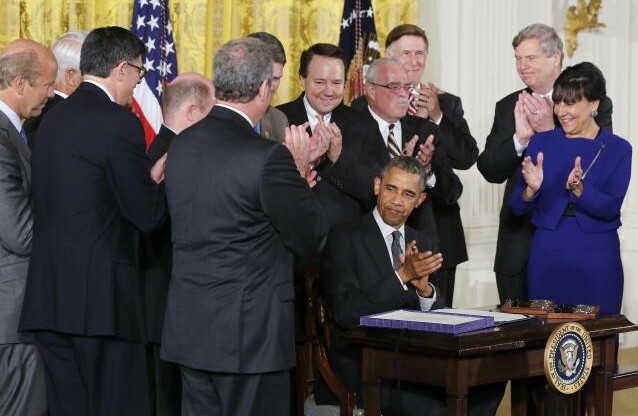 President Obama signed the ‘Trade Preferences Extension Act of 2015’ on 29 June 2015 authorizing the renewal of the US GSP scheme, almost 2 years after it expired. The scheme, instituted in 1974 and renewed periodically is designed to promote trade in developing countries. It provides exporters of 122 countries duty free access to the US market for selected products. There have been many renewals (6 so far since year 2000) and as highlighted in a recent article, the last was the eighth time in a period of 30 years that the scheme expired without being renewed. The latest round of concessions is expected to come into effect on July 29th this year. Sri Lanka as one of the beneficiary countries would no doubt benefit from the renewal of the GSP scheme but to what extent? And to what extent were the concessions utilized before? What’s the stability of the scheme? This article takes a brief look at what’s on offer. US is the single largest export destination for Sri Lankan products accounting for nearly 25% of Sri Lanka’s total exports. 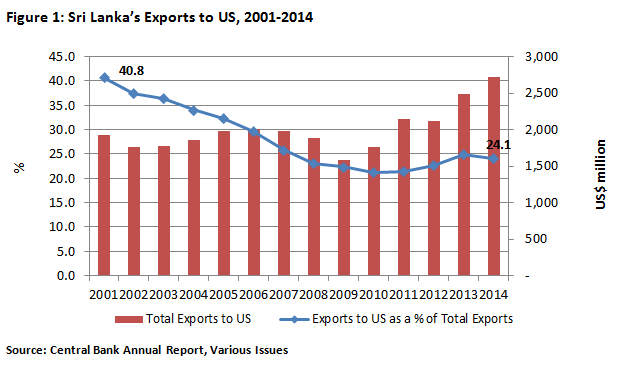 Although the total exports to US has increased over the past decade, albeit with few fluctuations, share of exports to US as a percentage of Sri Lanka’s total exports has gradually declined (Figure 1). While the share of exports to US accounted to over 40% in 2001, it has nearly halved by 2014 recording a figure of 24%. At the same time export basket is concentrated around a few product categories (Figure 2). Bulk of the exports consists of apparel and articles of apparel, with a share of over 70% of Sri Lanka’s total exports US. The US GSP scheme provides duty-free access to only about 3500 products (8-digit tariff lines) for beneficiary developing countries like Sri Lanka. 43 countries listed as least developed beneficiary countries (LDBCs) receive additional benefits. LDBC’s receive the following benefits: (i) GSP treatment for a higher number of products – in addition to the 3500 products that all other beneficiaries receive preferential access, 1500 products from LDBCs get duty-free access to the US market – and (ii) they are not subject to competitive need limitations. In other words, if a beneficiary country exports over 50% of US’ total imports of that product or exceeds a designated dollar-value limit (US$ 170 million in 2015); a country will lose its GSP concession for that product. Sri Lanka however, being a middle-income country does not receive LDBC benefits. All SAARC countries except Bangladesh are beneficiaries of the US GSP programme and among them Afghanistan, Bhutan and Nepal are identified as LDBCs. A benefit of other countries in the SAARC region receiving GSP preferential access is that Sri Lanka can utilize the provisions extended by US GSP to treat these SAARC countries as one country under GSP under cumulative rules of origin requirements. Products such as textiles and footwear are prohibited from receiving GSP treatment. In addition, watches, work gloves and other leather apparel are not eligible for GSP concessions. However, products which were deemed ‘import sensitive items’ such as certain handbags, luggage, and flat goods and were previously excluded from receiving GSP concessions are now allowed to be considered for duty-free treatment under 2015 GSP programme. Due to the limited coverage of the products exported by Sri Lanka under the GSP scheme, its benefits have been limited for Sri Lankan exporters. 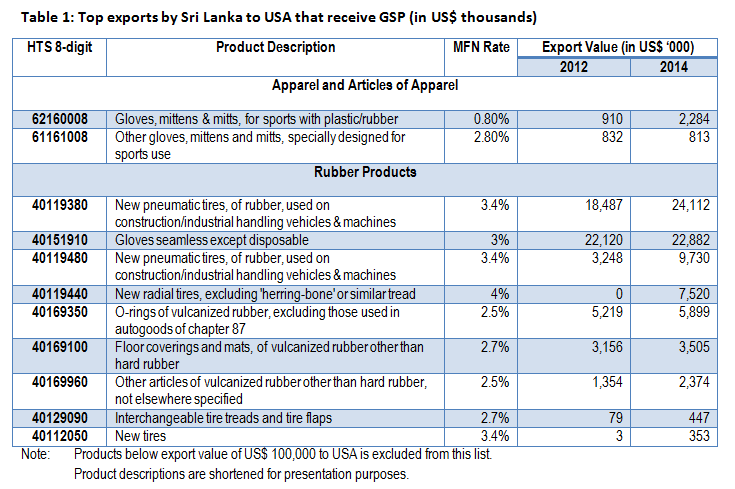 In 2012, only 7%of Sri Lanka’s total exports to US received GSP concessions (United States International Trade Commission, 2015).Of the apparel products only 0.11% of the total apparel exports to US were eligible for GSP in 2012,and the potential coverage of apparel after the revival of the GSP will be about 0.16% based on 2014 trade data. About 17% of the rubber exports to US were exported under the GSP scheme and the potential coverage under the new programme will be about 25%. Table 1 presents some of apparel and rubber exports which are currently being exported to USA and are eligible for 2015-GSP concessions. Nevertheless, an IPS study shows that the utilization of US GSP concessions has been high. The study highlights that high utilization rates combined with a low coverage indicates that Sri Lanka has been making use of the few preferences it receives under the US GSP scheme. A reason maybe that US GSP is simpler than some other GSP schemes. Unlike some of the GSP schemes offered by other countries, US provides duty free access to all products eligible for preferential treatment instead of varying levels of preferential treatment. At the same time, the documentation requirements are relatively simpler. Renewal of the US GSP scheme in June is for all beneficiary countries. US GSP concessions have not been withdrawn from Sri Lanka in recent times under any reason. Rather, the renewals are for the GSP programme as a whole. The requirement for renewal/reauthorization arise due to the new budget rules adopted by the US in 1990 which entail a ‘pay-as-you-go’ approach that require changes in government revenue/expenditure to include offsetting measures. In other words, for every year the GSP scheme is extended it needs to be complemented by spending cuts or tax increases in the budget. This has resulted in political complications. GSP expiration has hurt US businesses as well. According to the US government, US businesses have had to pay over US$ 1 billion as tariffs for products which entered duty-free prior to the expiration of the programme. Coalition for GSP claims that US businesses had to pay close to US$ 2 million daily as additional import taxes due to the expiration of the GSP programme in 2013. They say GSP expiration has resulted in lost sales, delayed capital expenditure, layoffs, etc. Although the duties collected during the period of expiration are refunded to the importers with the reauthorization of GSP, US businesses have been reported to be negatively affected by the expiry of the GSP. All-in-all, the renewal of US GSP concessions is expected to be only marginally beneficial to Sri Lanka. Although nearly three quarters of Sri Lanka’s exports to US are concentrated on apparel & articles, only about 0.2% of the current apparel exports are eligible to receive GSP concessions. Exporters of rubber, the second largest export product to US, will have only about a quarter of their exports covered under GSP concessions. However, on a positive note the utilization of US GSP concessions by Sri Lanka has been high historically, despite low product coverage. Therefore, while providing some benefits to Sri Lankan exporters, the renewal of US GSP concessions cannot be expected to make a significant enhancement to Sri Lanka’s exports to the US, especially given the country’s concentrated export basket. For more information on the US GSP check the U.S. Generalized System of Preferences Guidebook published by the United States Trade Representative Office click here. This article was co-written by Swendrani Jayaratne and Dharshani Premaratne. They are both Research Officers at IPS.